His name first hit the IITS radar around the time of the UK riots. Fusion was chairing an international debate on the aftermath of the riots when he challenged the youth audience to name an inspirational figure who represented the views of their generation. From the lengthy silence emerged the name, George The Poet. A few hours and YouTube clicks later and it was clear why the approval for this gifted urban griot was universal. George recently joined us on the panel hosted by Fusion for the first leg of the Music Potential taster session in Waltham Forest, alongside his manager Zeon Richards and Natasha Mann from Island Records. George enthralled the audience that day with his wordplay and wisdom. On the eve of the Music Potential taster at Stratford Circus, where he will be joining us again, IITS puts you up on a rising star. 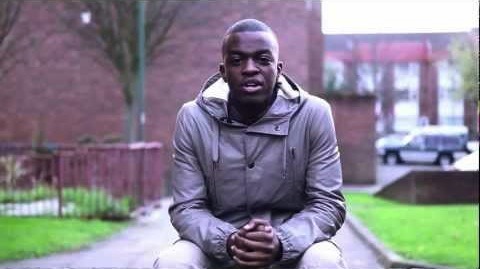 George The Poet is an up and coming act from North-West London. At twenty-one years of age he offers politically conscious and often humorous social commentary through poetry. This draws from his life in London’s inner-city as well as the Politics, Psychology and Sociology course he studies at Cambridge University. George champions a new brand of poetry which is set for commercial and critical success. George, in a short period of time, has been able to progress from urban nights in London to this week being confirmed to headline the Elgar Room in the Royal Albert Hall and a performance at the Euro Finance conference in Monaco on behalf of Citi Bank. George was first featured on SBTV then fronted the BBC 2012 Hackney Weekend and Olympic TV advert. His online poems have received over 100,000 YouTube views with ‘Olders’ and ‘Yolo’ gaining response from people such as Wretch 32, Chip and Nihal. He has also been awarded £20,000 by Barclays and Channel 4 to help his poetry workshops go nationwide. In June, George was invited to perform at the Business In Community Awards in the presence of Princes Charles and since has been courted by numerous corporate companies. George is currently working with Naughty Boy (Wiley, Devlin) amongst others and his future is looking bright. Watch this space.